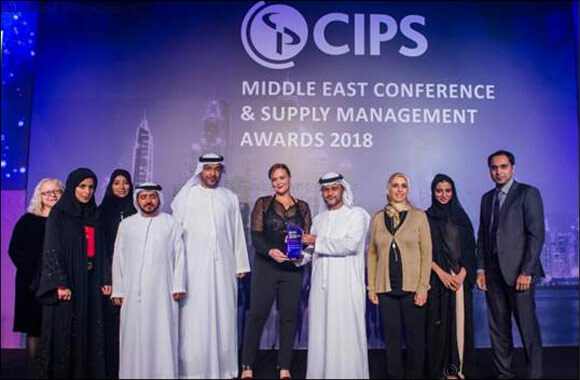 11th July 2018, Abu Dhabi, UAE: Abu Dhabi Airports' Procurement and Logistics Department has won the “Best People Development Initiative” and “Most Innovative Use of Technology” at a ceremony held in Dubai by the Chartered Institute of Procurement and Supply – CIPS. Recognized as international standards of excellence within the industry, the CIPS awards validate the outstanding work and effective performance achieved by Abu Dhabi Airports' team. “I would like to recognize and thank everyone from the winning team for their hard work and continuous commitment to developing Abu Dhabi Airports into a sophisticated, world-class business that is recognized internationally for its accomplishments and outstanding performance,” added Al Zaabi. The Chartered Institute of Procurement & Supply (CIPS) is a UK based international organization working for the purchasing and supply professions. With the objective of leading excellence in procurement and supply, it aims to promote best practices and provides services for the benefit of its members and the wider business community.